The Lady Vikings Soccer team heads out on the road again this week with a JV/Varsity double header tonight at Bishop Lynch at 6:00pm and 7:30pm and then again on Wednesday at 6:00pm with just the varsity. The players had a rare half a week off last week with all the Thanksgiving soccer showcases cancelled due to the weather. "We look forward to getting back to work," LVS head coach, Jay Fitzgerald said. The Lady Vikings have 4 more games left before Final Exams start in 2 weeks, with 3 of the 4 games being district games. We give Thanks to all our supporters, our fans, our community, our friends, our families, and most of all, to God, who gives us the opportunity to compete to the best of our ability each and every day. The JV season officially kicked off last week at home against the varsity team from Pantego Christian Academy on Thursday night. The first half saw little action in either attacking end, most of the play being done in the middle of the field. Credit that to two backlines that were making it very difficult to get behind. The Lady Vikings and Lady Panthers would go in a scoreless deadlock. The Lady Vikings played a different game in the second half rattling off 4 goals in the 35 minutes of play. “They took the information at half time that was given to them, and they ran with it,” MmMechalske said. Anna Keller started everything off getting on the end of a ball played over the backline, a few bounces and a volley found the back of the net. Next it was freshman Alexis Dickenson slipping through the backline who found a wide open Keller on the backside to easily tuck it away. The Lady Vikings had found their stride as Sophie Bailey tacked on the third of the night with great individual effort in the box. Pantego would not let up and created a few chances of their own, eventually slipping one past for a goal of their own. The Lady Vikings would add one more from Rachel Emrich in the remaining 13 seconds of the match as they closed out their season opener with a 4-1 win. They will travel to Bishop Lynch next Monday at 6:00pm with the varsity following at 7:30pm. The Lady Vikings traveled to Liberty Christian for their 3rd straight road game and jumped out to an early 3-0 lead before the midway point of the 1st half. Katee Kimmey and Hannah Allred combined for the 1st goal of the night which was credited as an own goal. Emily Keoughan and Allred added to the score with 2 nice goals to give the Lady Vikings a 3 goal lead. The Lady Lions got back into the game with a goal of their own off a corner with about 4 to play in the first half. "We switched off for one moment but the first half was absolute quality. 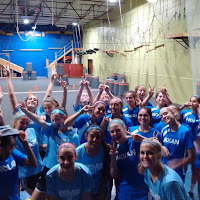 The chances we created were from all over the field; it was fun to watch, "said LVS head coach Jay Fitzgerald. A bit inconsistent throughout the beginning of the second half, the Lady Vikings scored another goal with another nice combination between Keoughan and Allred. Down by 3 goals, Liberty got themselves another corner and capitalized for their second goal of the evening in the 73rd minute. Rachel Beirermann scored both goals for the Lady Lions. The Lady Vikings move to 4-0-0 in district play while the Lady Lions drop to 2-1-0. Nolan continues their road trip the Monday after Thanksgiving as they travel to Bishop Lynch for a JV and Varsity match. The Lady Vikings traveled to Plano Prestonwood tonight through rain and thunderstorms but all they needed was an 80 minute window to defeat the Lady Lions by a score of 5-0. The game was originally scheduled to kick off at 7:30pm and got delayed only 15 minutes. The wind picked up throughout the game and the rain began to fall starting at halftime and throughout the entire second half. "We talk about external conditions all the time and tonight the conditions were very difficult to play in," said Lady Vikings head coach Jay Fitzgerald. Senior, centerback Regan Hafer got the scoring started off a corner in the 20th minute and then 5 minutes later, Hannah Allred scored her first goal as a Lady Viking off a blast from the top of the 18. Fitzgerald went on to say, "This game was very unpredictable with a strong wind and the second half going into a 30-40 mph wind we played some of the best soccer of the year." The Lady Vikings scored 3 goals in the second half with Allred and Hafer adding one more each and Megan Bettinger scoring her 4th goal of the year. Selena Guzman had 2 assists on the night while Brennan Flynn, Kate Kleiser, Emily Keoughan, and Bettinger all had one each. Hafer and Allred on their thoughts on the conditions and the match. Liberty Christian (2-0-0) is up next for the Lady Vikings (3-0-0) and that match will be tomorrow night, on the road, kicking off at 6:00pm in Argyle. The JV host Pantego Christian varsity on Thursday at home at 6:00pm as well. The Lady Vikings varsity soccer team hits to road on Monday and Tuesday of this week taking on Prestonwood Christian and Liberty Christian. Mondays match will kick off at 7:30pm in Plano while Tuesdays match is set for 6:00pm in Argyle. On Thursday, the JV team will host the varsity team from Pantego Christian at 6:00pm at Doskocil Stadium on the campus of Nolan Catholic High School. A slow start to the evening but the Lady Vikings found their stride 20 minutes into the match as Emily Keoughan rattled off back to back goals. That wouldn’t be the end to her night either as she found the back of the net one more time in the second half. “It’s a hard environment to go into and play. For our first road test of the season I thought our ladies needed the time in the beginning to settle in and find their roles, " said LVS assistant coach, Alex Mechalske. Mikaela Gamboa would finish the first half off with a goal of her own on a cross from Selena Guzman. She would also get the second half scoring started with the help of great individual play from Katee Kimmey. Another shutout night from our backline and senior goalkeeper, Gracie Emrich. Alyssa Clinkscales, Kate Kleiser, and Jordan Hisel also added to the scoring on the night with goals of their own. Hisel scores the first high school goal of her carer, while Clickscales gets her second on the year to extend her goal streak to 2 games. Mechalske added, "second chance efforts from quality individual effort was nice to see." The 2-0-0 Lady Vikings continue district play next week with back to back away games at Prestonwood and Liberty on Monday and Tuesday. The JV play there first game of the season on Thursday night at home as they host the varsity team from Pantego Christian Academy. That match will kick off at 6:00pm. The Nolan Catholic Women's Soccer team took a 2-0 lead within the opening 9 minutes of play on goals by Mikaela Gamboa and Megan Bettinger. Midway through the first half they had already doubled their lead with a goal a piece from Gamboa and Bettinger. 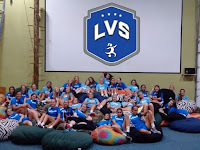 "We have had a solid pre-season to this point and it is nice to see it all come together as we play a game that matters," said LVS head coach, Jay Fitzgerald. Bettinger added another goal while Abbey Button and Alyssa Clickscales both score their first high school varsity goals of their careers. Senior, Gracie Emrich and sophomore, Sarah Becan combined in goal in the 7-0 shutout win over Parish Episcopal. Emily Koeughan, Brennan Flynn, and Allee Kimmey each got their names on the score sheet with helpers on the evening. 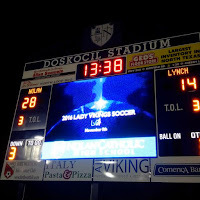 The next game for the Lady Vikings is Thursday evening at 5:30pm on the road at Bishop Dunne. With games cancelled last week due to weather the Lady VIkings open district play at home tomorrow night as they host Parish Episcopal. Tuesday nights match is varsity only. LVS head coach, Jay Fitzgerald commented, "We can't wait for tomorrow night... new team, new stadium...come out and see the show." Kick off is at 6:00pm. District play continues on Thursday night at the Lady Vikings travel to Bishop Dunne for a 5:30pm kick. The 2016 Lady Vikings Women's Soccer Team opens district play at home on Thursday. They will host John Paul II with the JV kicking off at 6pm with the varsity following at 7:45pm. 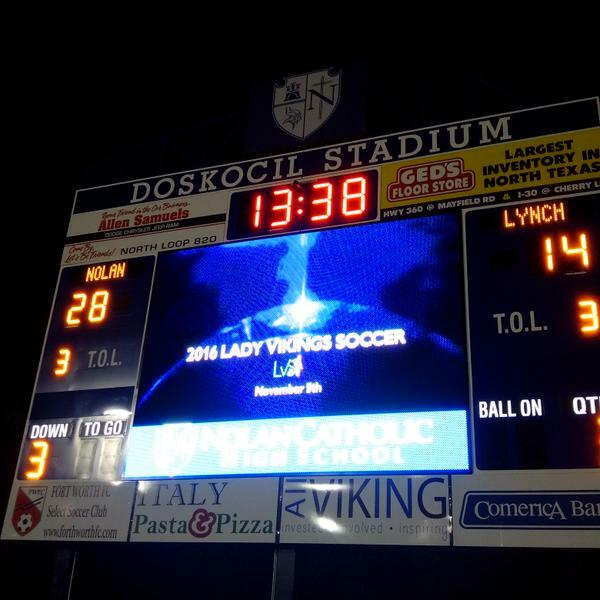 LVS is in search for their 5th TAPPS State Title. "We always like our chances, I can't wait to get going with this group. We have had a solid pre-season, we have amazing personalities, and special talent, " mentioned LVS head coach, Jay Fitzgerald, who is in his 17th year in charge of women's soccer. On Tuesday night, the varsity will take on THESA in their final pre-season match before district play begins. This match will kick off at 7pm at Doskocil Stadium. 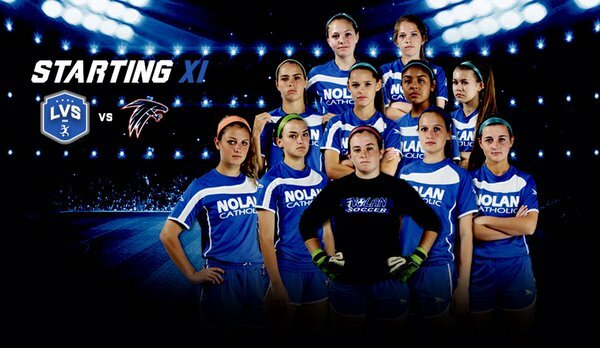 Come out and support your Lady Vikings at the brand new Doskocil Stadium all season long. See your face on the state of the art video scoreboard and sit in the shadows of the amazing new press box.